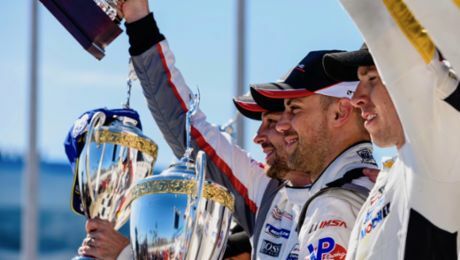 Porsche works drivers Earl Bamber and Frédéric Makowiecki have clinched third place with their Porsche 911 RSR at round nine of the IMSA SportsCar Championship on the Virginia International Raceway. For Porsche, this marks the first podium result in the most important sports car racing series on the North American continent since May 1st. Back then, they also finished third at the Laguna Seca round with the GT racer, which was developed in Weissach based on the seventh generation of the iconic 911 sports car. 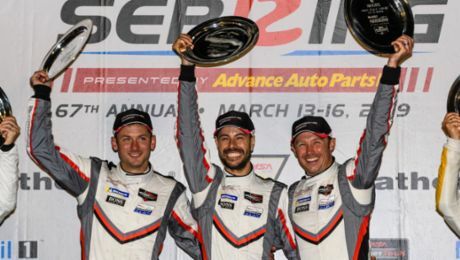 In the sister 911 RSR fielded by the Porsche North America works team, the Long Beach winners Patrick Pilet (France) and Nick Tandy (Great Britain) earned vital championship points for sixth place. Spectators lining the tradition-steeped 5.263-kilometre race circuit in the US state of Virginia were treated to some action-packed racing, despite the absence of the P and PC classes. In hot summer temperatures reaching 35 degrees Celsius, drivers delivered tough duels for positions, particularly in the GTLM class in which five automobile manufacturers battle for victories and titles. After the first round of pit stops, Earl Bamber took over driving duties from Frédéric Makowiecki in the number 912 contender and was running in third place. After a difficult qualifying, the Frenchman had taken up the race from the ninth grid spot but made up ground with consistently fast lap times. Patrick Pilet took over from Nick Tandy and was sitting in fifth. But in the 48th lap, the two left the track in quick succession and lost positions. Patrick Pilet had to return to the pits to remove pieces of grass that he’d collected on his number 911 Porsche 911 RSR from his excursion into the greens. Despite this setback, the Porsche pilots didn’t give up. In a dramatic closing stage of the race, which was shortened by the one and only caution phase in the entire 2:40 hour race, Earl Bamber took up the charge again with the 912 contender and, after a spirited chase, brought it to a successful conclusion by reclaiming third place. Patrick Pilet, who had at times fallen back to eighth place, finished the race on sixth. In the GTD class, in which customer teams field the Porsche 911 GT3 R, the former Porsche Junior Alex Riberas (Spain) and Mario Farnbacher (Germany) also made a great comeback. After receiving a drive-through penalty, the Seattle/Alex Job Racing pilots found themselves at the back of the pack, from where they put in an inspired drive to plough through the field to net fourth place. Mario Farnbacher (911 GT3 R #23): “That was a strong team effort today. Most of our direct championship rivals finished behind us. That keeps things exciting." SportsCar Championship will be contested on 17 September on the Circuit of the Americas in Austin in the US state of Texas.